Be unfraid. Be very unafraid. 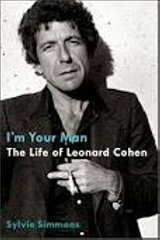 Leonard Cohen already had a biography, a pretty decent one by rockbook standards. Published in 1996, in the middle of a prolonged monastic retreat that appeared to put an end to the 62-year-old's public life, Vancouver English professor Ira B. Nadel's Various Positions is strong on Cohen's Jewish identification and poetic career if not so hip about the music that's why the book happened. But in I'm Your Man Sylvie Simmons blows Nadel away. Up there with such recent competition as RJ Smith on James Brown and Chris Salewicz on Bob Marley, she's constructed a hard-thinking music journalist's book where Nadel's is an openminded literary academic's. Having interviewed damn near everybody where Nadel did very little such digging, the San Francisco-based Brit isn't just much better than Nadel on Cohen's many music-biz enablers--she's better on his privileged youth in Jewish Montreal too. Most important, she's infinitely better on what she--ponder that pronoun: she--has the common sense to make thematic from her title on out: women. G-d knows how many of the holy creatures Cohen has bedded in his 78 years--hundreds for sure, including Joni Mitchell and once Janis Joplin, unnamed seekers in that monastery, and briefly manager Kelley Lynch, who eventually robbed him of something like 10 million dollars, thus rousing him to a level of public activity and prestige few performing artists of 78 have ever achieved. Even Nadel mentions a few liaisons Simmons doesn't. But Simmons has gotten the details the major ones deserve: the saintly Marianne Ihlan of "So Long Marianne" fame; hot-headed Suzanne Elrod, the mother of his two children and his common-law wife for 10 years (the only one who seems bitter, although he's close to the kids, singer-songwriter Adam Cohen and Lorca Cohen, who has long lived downstairs in his Los Angeles duplex); distant Parisian photographer Dominique Isserman; May-December smart-beauty-with-a-dirty-mind Rebecca de Mornay; and his consort and collaborator for the first eight years of this century, Anjani Thomas. OK, so we knew he's been quite the ladies man. But by soliciting the memories and insights of the Ihlan-Elrod-de Mornay-Thomas succession (Isserman didn't sit for an interview), Simmons portrays a man who was a remarkably intense serial monogamist no matter how much he got on the side--an adorer of women and a votary of beauty. No wonder, as Simmons reports, the fans at Cohen's European concerts in the '70s were three-quarters female. Yet she's equally diligent tracing Cohen's other non-artistic obsession: religious enlightenment. She details his devotion to the Jewish rituals passed down by his rabbi grandfather; fully describes the disciplines imposed by his now 105-year-old guru Roshi, who ordained him a Zen priest; devotes many pages to Cohen's substantial and decisive post-ordination studies with a Hindu teacher in Mumbai; and respects his early fascinations with Catholicism and Scientology as well. These twin obsessions, one carnal and one spiritual, are source and content of Cohen's laboriously perfected, stubbornly prolific body of work, which Simmons doesn't neglect to analyze and appreciate. I'd say she overrates such works as Beautiful Losers, Death of a Ladies' Man, and Dear Heather. But that's a privilege she's earned. Though you'd never guess it from the awards showered on him--after all, he's touring at 78, and a Canadian citizen to boot--Cohen isn't Yeats or Lorca, and knowing the backstory of this lifelong depression fighter and belated superstar may not altogether allay your skepticism about his ultimate aesthetic import. But it will certainly induce you to understand where he's coming from, and why. For someone who loves writing every bit as much as music, the plethora of rock memoirs and biographies is a glut, a contagion, a hypertrophy--a wretched excess meant to squeeze a few last entertainment shekels from consumers born so long ago they remember how it feels to commit to a musician for life and turn a page-turner's physical pages. Occasionally a definitive biography emerges from the system. But beyond Bob Dylan and Patti Smith, the memoirs that rise above tend to be outliers: better Jen Trynin or Nile Rodgers than Pete Townshend or Bob Mould. There was reason to hope The John Lennon Letters would be another kind of outlier--accidental genius by a rock and roller whose intentional genius has already inspired levels of personal identification that rival those of Dylan himself. Or maybe that was just a bereft response to how poorly the legacy of this beloved genius, dead 32 years now so what the hell's the problem, has been served by all the books coughed up by anybody who ever spent six months in his proximity. In 2007, preparing the Encyclopedia Britannica entry on Lennon, I was dismayed to learn that the big bios were by ax murderer Albert Goldman and awestruck manservant Ray Coleman. Since then, however, the estimable Philip Norman has produced the thorough and reliable John Lennon: The Life. In theory, The John Lennon Letters might have proved an equally reliable and more intimate companion piece. It isn't, for three reasons. Because everything an avatar touches gains exchange value thereby, editor Hunter Davies tells us, "any scrap, any word" Lennon ever scrawled is now a collector's item, and collectors are greedy, willful creatures. Nor can one expect even faintly embarrassing materials from Lennon's intimates, especially Yoko Ono, who supported this project but remains a cautious and self-interested guardian of the legacy Lennon entrusted to her. 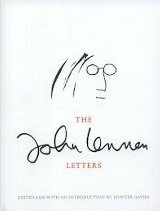 Most important, it turns out that for all his verbal gifts Lennon wasn't much of a letter writer. Davies, a Beatles intimate since he wrote the group's first biography in 1968, explicitly denies this. Lennon "loved writing letters," he claims toward the end of a collection that includes public statements and legal documents written by Lennon's handlers, filled-out questionnaires, a book review The New York Times extracted from him, some valuable annotations to Imagine, and half a dozen shopping lists. But I believe what he told his half-Egyptian cousin Liela, who got more mail from him than most: "I seldom write letters myself." When he did, moreover, his impulse was to joke around rather than reveal himself, sometimes with the same kind of dumb stuff you or I might use to tart up a quick missive--"Having a wonderful. Wish I was here." went a postcard (there are many postcards among Davies's 285 treasures) to his wife Cynthia toward the end of their marriage--and sometimes with the kind of complex-to-obscure wordplay fans have already quaffed to the dregs from In His Own Write and A Spaniard in the Works. There are exceptions, however: two tantalizing pages of a seven-pager to Cynthia in which he excoriates his own inattention to their son Julian, six punny letters and many postcards to his gifted sometime aide-de-camp Derek Taylor, engaged and thoughtful responses to fans who in a few cases seem to have been picked at random out of a mailbag, and lots of reach-outs to relatives like Liela. Perhaps I shouldn't be so impressed by Lennon's continued involvement with his complicated family--including his rapprochement with his biological father Freddie, his sporadic relationship with Julian, his correspondence with feisty Liela, and the nagging secondhand presence of his Aunt Mimi, who brought him up and to hear him tell it never took his success seriously. But it has a different kind of presence in this first-person evidence than as described by others. The evidence of his warmth to fans is also striking, especially since there's also evidence of his nasty side (including a satisfying kickback at a Jesus freak and a "How Do You Sleep" sidebar for Paul and Linda). And I can't resist quoting what he wrote to a waitress at L.A.'s Troubadour during his lost weekend period: "Dear Pam, I apologize for being so rude and thank you for not hitting me. P.S. Harry Nilsson feels the same way." Unfortunately, much of what I've just cited comes from the last third of the book--the solo third, the post-Janov third, the househusband third, etc. He had more time then, of course, but that's not all--Lennon's humanity does seem to have broadened post-Beatles/as he got older/with Yoko. Even the shopping lists fascinate--anyone who believes the househusband thing was an act will please explain how he knew what kind of Friskies the cats liked and which greengrocer had the best strawberries. But none of this improves the first two-thirds an iota. Thin pickings. Nevertheless, as one of those who's always identified with Lennon not Dylan, I have to acknowledge that this book touched me a little deeper than I would have figured. With every letter reproduced in its original form as well as transcribed--complete with legible handwriting, terrible typing, original drawings, and the beak-nose-and-granny-specs cartoons of himself he scribbled thousands of times--it's a mass-produced reliquary, and it goes on the A shelves. For this merry Christmas and happy New Year (let's hope it's a good one without any fear), it's a Sasquatchian stocking stuffer for the Beatles fan who can never get enough.